Lots of robot toys look like real animals, but they can't walk the walk. 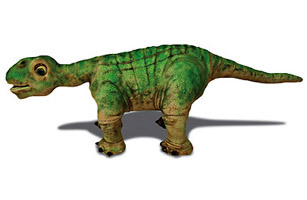 Pleo, which is modeled after a baby camarasaurus (a plant-eating dinosaur), aims to be more lifelike. When it walks, its whole body sways. It's equipped with more than three dozen touch, sound, light and tilt sensors, and it even has moods. Ignore Pleo, and it will get depressed and sleep all day. Give it some TLC, and it will wag its tail when you get home and purr like a cat. O.K., maybe it's confused about which animal it's supposed to be--but it's sure got (a mechanical) heart.